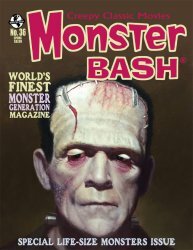 MyMovieMonsters.com > Monster Magazine Marketplace > Monster Bash > Monster Bash magazine #36 - Life-Size Monsters Issue - LATEST ISSUE! 56 pages black & white including color cover and color centerfold (it's G-rated!). See our special Scary Monsters color ad on page 30! Collectors Note: Brand-new and uncirculated; received directly from the publisher. We will ship the best condition copy -- first come, first served. Purchasing Instructions: You must choose whether or not you'd like your copy bagged and boarded (slipped into an archival-quality poly bag with backer board) at the drop-down menu above. Interested in attending Monster Bash in addition to reading the great magazine? Go online to monsterbashnews.com for the latest information on the next classic monster conference and film festival!